Wild Horse Roundup-Curtis Schrimp: Well this starts another week and still no rain. About Town-Ida Lessenden: I happened to tune into a television station that featured the Greeley Stampede Parade. I am glad Kiowa County Queen Darci Weeks represent our county there. An old-fashioned theme has been chosen for this year Eads Appreciation Day, Good Ol' Summertime. The Press has a new look this week. Our regular typesetter Connie, has a 3-week vacation in Oklahoma so Ol' Ham started fussing with the computer and what you see is what you get. The Division of Wildlife is extremely worried on the economic impact on the Kiowa County reservoirs if the geese are forced to fly over because no water in the reservoirs. The Peoples Natural Gas Co will definitely close in April, putting office manager Alice Weil out of work and Darrel Hebberd will work out of his home. The State Highway Commission approved an $83.2 million construction budget. No projects were approved for Kiowa County, nor was Kiowa County's name on the list of postponed projects. Howlett's Corner is the new agent for Continental Trailways bus in Eads. Service three times daily - northbound and southbound. Full freight & passenger service to anywhere. 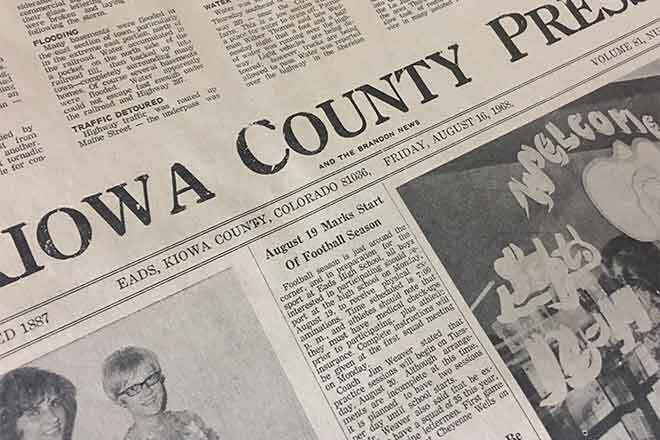 Miss Gail Voss of Haswell was selected as 1967 Kiowa County Fair Queen. Miss Lee Jean Dawson of Brandon selected as the Queen Attendant. Eagle Scout Daryle Lovett will represent Rocky Mountain Council in the annual report-to-the-nation program.